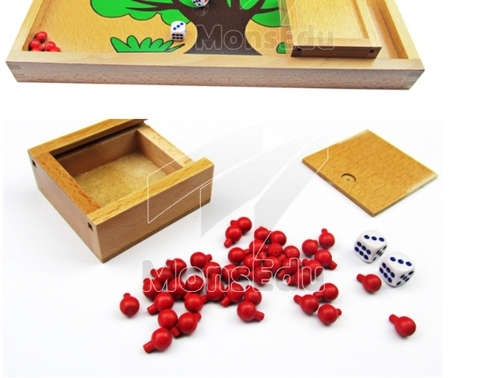 With 35 holes, dice, small wooden box. When using this material, children develop concepts in quantity recognition, more-than and less-than relationships, simple combinations of numbers, as well as the fundamentals of addition and subtraction. The game has different levels of complexity, making it possible for the children to develop skills progressively. The game can be played by two or more players. The simplest game begins by placing all the apples on the tree. Each player takes turns throwing a die and removing the required number of apples from the tree, until all apples are removed. Alternatively the apples can be divided evenly amongst the players, then each player take turns (with 1 or 2 dice depending on the ability of the children) to see who can get all their apples on the tree first. More challenging is playing either of these games where the different shades of the tree restrict which apples can placed or taken. Children can also develop their own rules.